Fear of pain is the number one reason people give for not making regular visits to the dentist. At the same time, a majority of dentists report experiencing anesthesia-related problems during restorative dental procedures. If dentists are able to administer successful local anesthesia, patient compliance and satisfaction are likely to improve. Pulpal anesthesia is a vital part of the delivery of dental care for restorative dentists and endodontists. Administration of local anesthesia is invariably the first procedure they perform and it affects everything they do thereafter. If the patient is not adequately anesthetized, difficulties inevitably arise. 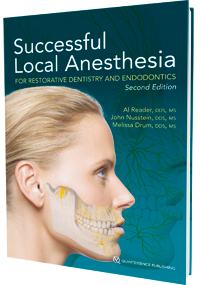 This book will help you successfully anesthetize your patients using the newest technology and drugs available. It presents the rationale, advantages, and limitations of the various anesthetic agents and routes of administration. A special emphasis is placed on supplemental anesthetic techniques that are essential to the practice of dentistry. Ogle, Orrett E. / Dym, Harry / Weinstock, Robert J.